Photo: Scenes from the 52nd Independence Flag Raising Ceremony, held yesterday at D’urban Park. Over 4000 students participated in the cultural show. The theme for the event is ‘Celebrating our People and our Patrimony’. With the theme: Celebrating our People and our Patrimony, the Ministry of the Presidency, Department of Social Cohesion “showed up and showed out” at the country’s 52nd Independence Flag Raising Ceremony held yesterday at D’urban Park. 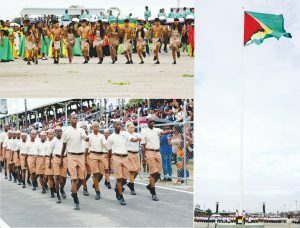 Hundreds of Guyanese turned out to view the cultural show and the hoisting of the Golden Arrowhead, and judging from the crowd’s reaction, hardly anyone left disappointed. Persons began filling the seats in D’urban Park as early as 13:30 hours to get the best seat for a great view in anticipation of the cultural display, the march past and the hoisting of the flag. Before the show began, the bleachers were filled with eager spectators. Even though the ceremony began at 14:00 hours, one hour before government workers were expected to leave work, this did not stop them from attending. Teachers with groups of students from their various schools in Georgetown; large families, young and old, were there to witness the event. President David Granger and First Lady Sandra Granger; Prime Minister Moses Nagamootoo and his wife Mrs. Sita Nagamootoo, were in attendance along with government ministers and other dignitaries. Over 4000 students from primary and secondary schools participated in the event. The ceremony was divided into two segments: Cultural Display and Our People. Students from primary schools participated in the first half while the students from secondary schools participated in the second half. In the Cultural Display segment, students from St Stephens Primary, St Pius Primary, Smith Memorial Primary and many others, including Guyana National School of Dance, showcased Guyana’s flora and fauna through their attire and dance. 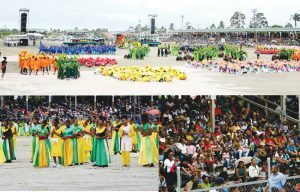 In the ‘Our People” segment, students from secondary schools such as St John’s College, St Joseph High, North Georgetown Secondary, North, East and South Ruimveldt Secondary and the National School of Dance, among others, were dressed in cultural wear representing the Africans, East Indians, Europeans, Chinese, Portuguese and Amerindians—the six races in Guyana. 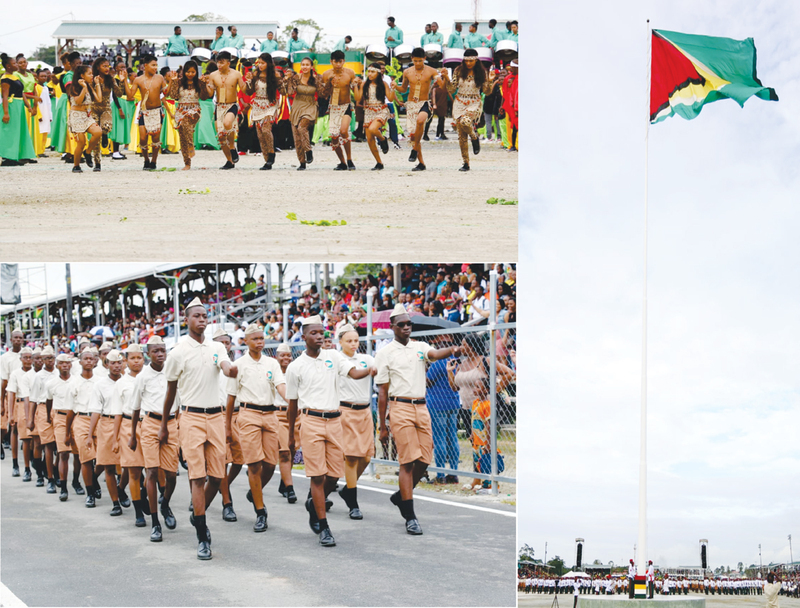 After the cultural display, participants from the primary and secondary schools, the Schools’ Cadet Corps, the Guyana Scouts Association and the Seventh Day Adventists Pathfinders Club, marched alongside members of the Guyana Defence Force, after which the Golden Arrowhead was hoisted. The children’s rally was described as impressive by members of the public as they exited the venue.The flag was hoisted around 16:30 hours after which persons left to prepare for the Flag concert which was held last night at the Stabroek Square. 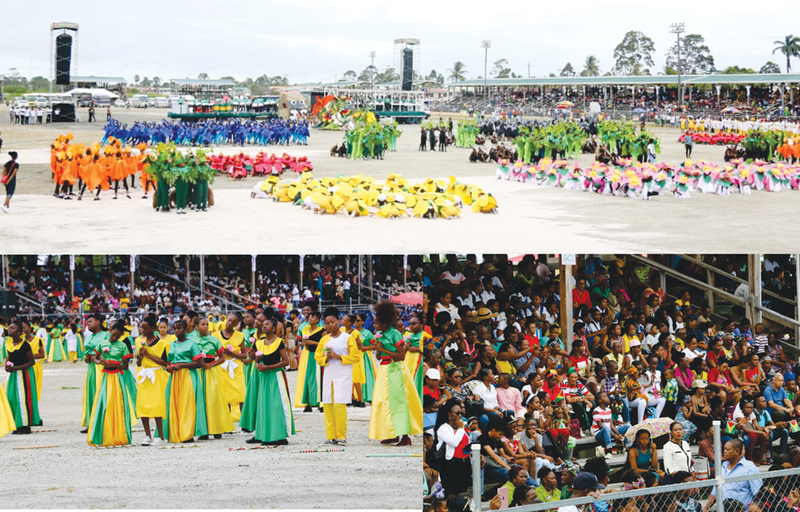 Guyana is marking the 52nd anniversary of its political independence from Britain on Saturday with President David Granger using the occasion to remind nationals of the importance of providing greater protection to children. Beautiful Ceremony. Wish I was there to celebrate.